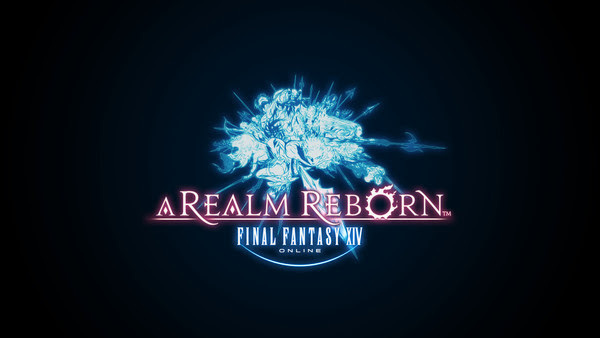 Final Fantasy : A Realm Reborn . Starting my new adventure ! Finally got my copy of this game. Stunning graphic! It is so beautiful yet not so heavy on my laptop. I expect a lot of lag/jerk or completely unplayable running it on my old Asus laptop to play this game (Nvidia GT335). I have played most of the game in FF series (mainly Ps1/Ps2 titles), but i never played the original Final Fantasy Online(because it is online?) . This time, because of the hype, i guess i wanna give it a try. Note that, i come from games such as Ragnarok , Dragon Nest but not World of Warcraft, Guildwars etc. 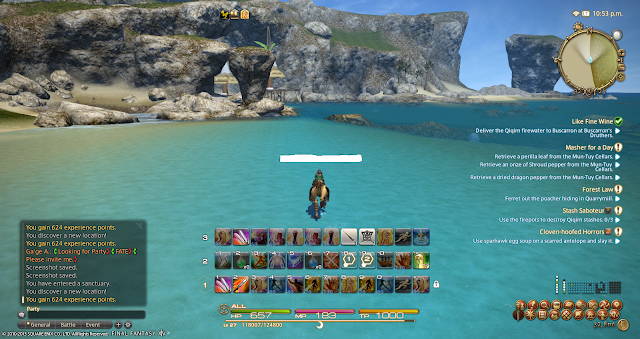 So, some of the things in FF is completely new to me. Well, the first let down is the large update after installing the game. 3.5 Gb update. Ouch. Well, that's acceptable since they are a lot of updates going on, which mean the developer (Square Enix) is doing their job well to ensure things to balance up and running well. But, 3.5GB with no resume capability? Major letdown. For you who have uber fast internet , thats not a problem. But im using slow internet with quota. Super ouch. Luckily i finished updating during nighttime where the line is more stable but it still takes 5 hours . Imagine the fear of disconnection and having to start over (I try sleeping until it ended ;( ). I start up as a pugilist, expecting to become a monk . Little did i know that the classes/job is distinguished from the beginning for 3 different roles, damage dealer, healer and tanker. I thought that the roles would depend on ones build (skills and equipment). But in this game, i can actually play all the job/class. So, i just proceed playing pugilist to learn and familiarize myself . 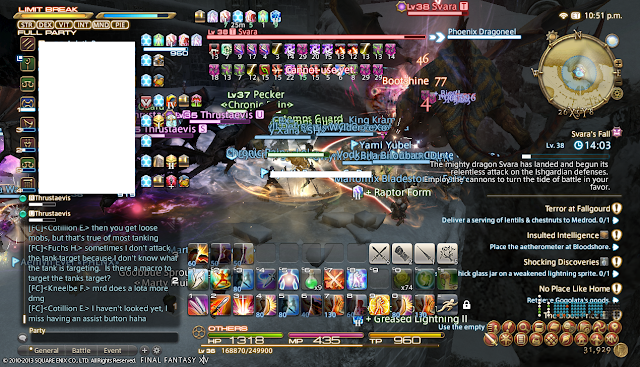 FATE stands for Fully Active Time Event, events that spawn throughout Final Fantasy world. This is the best way to level up at the moment. The exp offered is large, and the quest is very easy especially with large number of people. I'm quite surprised that my laptop can handle the crowd well, or is it because of the game engine? Apart from the EXP, i also get gil and GC seals. The seals can be exchanged with guild equipment and other stuffs. In FFXIV, the experience system is quite different compared to the other MMORPG games. There are actually 2 levels that you need to be concerned of. First is the physical level. The physical level will be leveled up anytime and by anything that you do in the game. Whether you do fishing, mining, or even battling with an enemy, you will be able to earn points for your physical level. As this increases, you will be given attribute points and element points. There are a lot of ways for you to be able to use these points but always remember to use this wisely and only to benefit your character. For example, if you are using a Tank, you will need to use these points in your Vitality stats. If your character has a great damage dealer, you will need to supply Strength points, to be able to add more damage points. Meanwhile, the element points are really tricky. You have to understand as to when and how to use them. To the best of my knowledge, they are supplemental abilities and defense points/stats. While you are engaging an enemy for a certain job, you will actually gain points that will increase the rank of that certain job. As your rank increases, you will notice that you have new abilities that are accessible to you that were not available before. However, you also find that your abilities are limited to the action points that you have earned. It does not mean that you have earned a new ability would also mean that you can use it immediately. Each ability is equal to a certain amount of action points. You will only be able to use a particular amount of abilities due to the limitations of the action points as well. So you will need to make sure that you are using the action points wisely every time you earn a rank. You will also find abilities that are really not that useful and you may discard them so that you will be able to make use with the abilities that are more powerful with enough action points for it. thanks! this game have unique system and requires some time for me to familiarize with it. but even the learning part is fun!